Looking at her picture, you may think that Earth is a water world. But the fact is that she is 99-percent dry rock. According to our current solar system formation model, this is impossible—a mystery that has puzzled scientists until now. Rebecca Martin and Mario Livio—of the Space Telescope Science Institute in Baltimore, Maryland—may have found the solution to this riddle using data from the Hubble Space Telescope. By observing how young stars behave, they came up with a new model that may forever change our understanding on how planets are created. In the original theory, called the standard accretion-disk model, the planets in our solar system formed from a disk of gas and dust around the sun billions of years ago. Gravitational forces caused this disk, called the protoplanetary disk, to condense in different lumps that eventually formed the planets we know today. If the snow line was inside Earth's orbit when our planet formed, then it should have been an icy body. 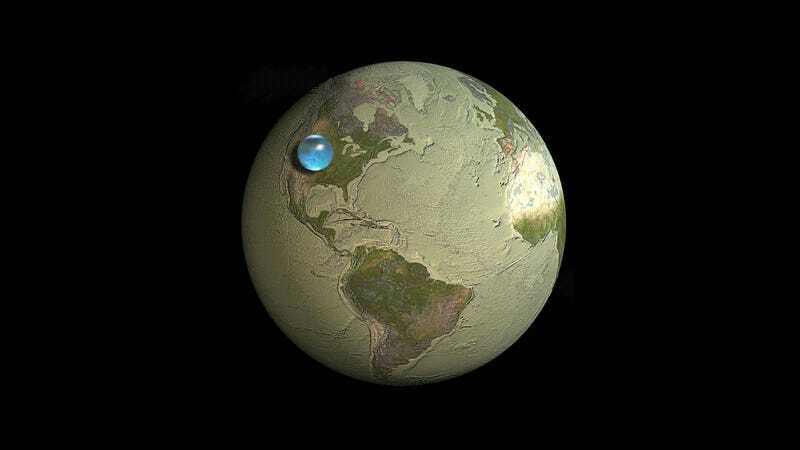 Planets such as Uranus and Neptune that formed beyond the snow line are composed of tens of percents of water. But Earth doesn't have much water, and that has always been a puzzle. Only 0.02% of Earth's volume is water and, according to current theories, that water may even come from the asteroids and comets that bombarded Earth after its formation. How is this possible? The answer seems quite simple. Martin and Livio found a problem in the old model: It didn't take into account the fact that "disks around young stars are not fully ionized." We said, wait a second, disks around young stars are not fully ionized. They're not standard disks because there just isn't enough heat and radiation to ionize the disk. Very hot objects such as white dwarfs and X-ray sources release enough energy to ionize their accretion disks, but young stars don't have enough radiation or enough infalling material to provide the necessary energetic punch to ionize the disks. They concluded that the snow line in the old solar system model was not in the right place. Since there was no ionization in the disk, the matter wouldn't move in the way that the old model accounts for. In fact, there would be many other areas. In the center there would be a turbulent region, very near the sun. Surrounding that there would be an icy dead zone, which would block any matter from falling into the sun. Unlike the standard accretion-disk model, the snow line in our analysis never migrates inside Earth's orbit. Instead, it remains farther from the Sun than the orbit of Earth, which explains why our Earth is a dry planet. In fact, our model predicts that the other innermost planets, Mercury, Venus, and Mars, are also relatively dry.